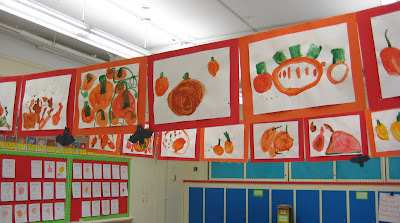 Although we didn't visit a pumpkin patch, the read about them and talked about them. We don't do a class trip this early in the year because some of the juniors are still learning our routines, and aren't quite ready yet. So we made our own pumpkin patch! It's flying in the air above our tables! If you look closely, you will see some bats flying up there too! 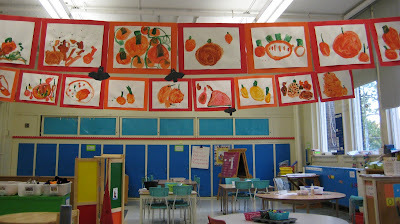 We talked about how pumpkins come in many sizes and shapes, and how some are for Jack-o-lanterns and some are for eating. We read books about the life cycle of the pumpkin too.